The Orbit LS low speed shaker is a high quality, general purpose shaker with economical analog control. Styled after the other models in the line, the Orbit LS features a streamlined, compact design with easy-access control panel. Electronic controls are utilized for setting speed and time. The knobs used for selecting parameters turn easily and are clearly marked with corresponding values. 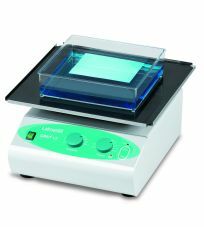 A large orbit and low speed make the Orbit LS useful for staining and destaining gels, washing blots and general mixing. The shaker is supplied with a 30 x 30 cm stainles steel flat platform and non-slip rubber mat to keep plates, dishes and other sample containers in place. Safe for use in temperature controlled environments, the small profile of this shaker makes it ideal for use in incubators.